Happy Eid! Over the weekend friends will be feasting around the world, and in Xinjiang no doubt people will be eating the dish I’ll describe below. Half a world away in Philadelphia, the weather is changing from hot to quite cool, and the season is getting perfect for eating things that are just a little bit heavier and a little bit richer. 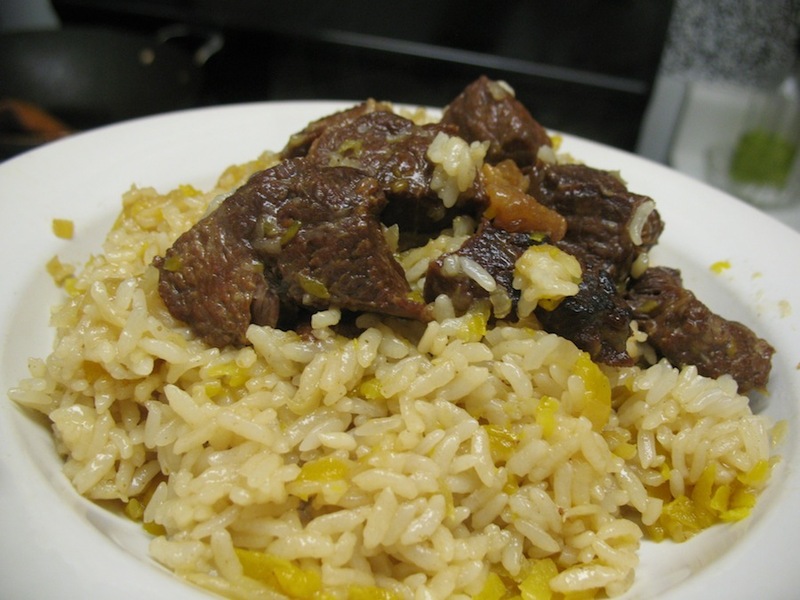 Many cultures of Eurasia lay claim to a form of rice pilaf as a “national dish”. Uyghur polo (پولو) is no exception. While other Uyghur dishes like laghman and nan remain popular and are important staples in Xinjiang, polo still occupies a higher position among other foods. 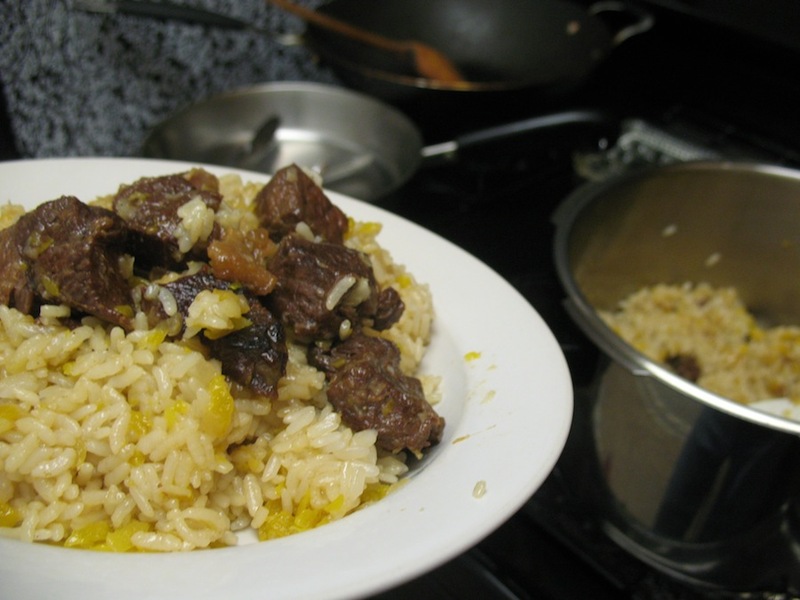 For many countries in Central Asia, the same is true with each national version of rice pilaf. If you cross the border into Kazakhstan, and beyond to Kyrgyzstan, Uzbekistan, Persia, Turkey, you can see the name slowly change to something recognizable in English: polo (Uyghur), palau (Kazak), palov (Uzbek), plov (Russian), pilav (Turkish). These words can be traced to a Persian root, and each version has a slightly different iteration. To the uninitiated, the Uyghur polo is pretty oily. It is generally considered a celebratory food, however, not something you eat every day. Most recipes you can find will use at least 1/4 cup of oil (usually more), and some of tastiest recipes will use rendered fat from the fat-tailed sheep, a popular domesticated animal in Central Asia. Unfortunately, I don’t have any of that today. 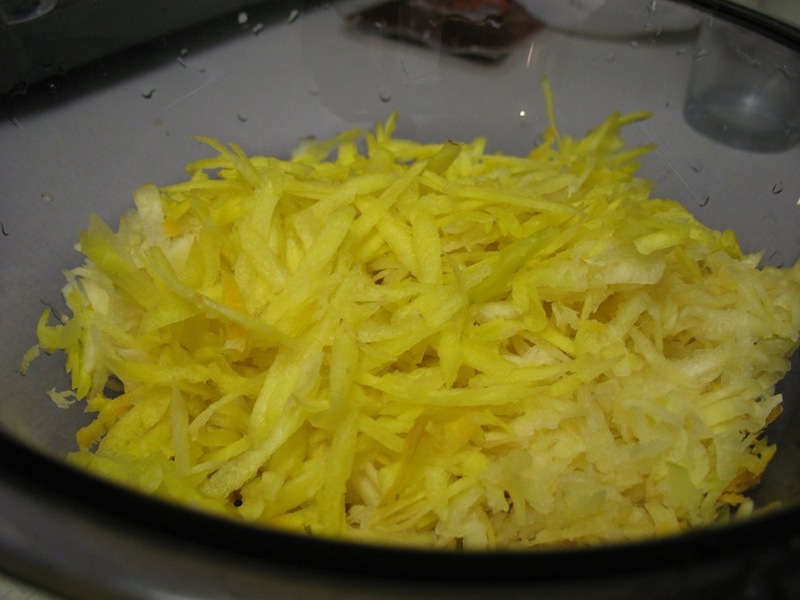 Something else that may seem out of the ordinary with this dish in Xinjiang is the use of yellow carrots. Nowadays we are finding more “heirloom” varieties of carrots at places like Whole Foods, including yellow and purple carrots, but for the past 300 years or so they have been primarily orange in Western Europe and the Americas. In Central Asia there are more varieties of carrot. This dish uses a lot of carrots. It might seem like too much, but they really bring an interesting sweet and savory to the dish. 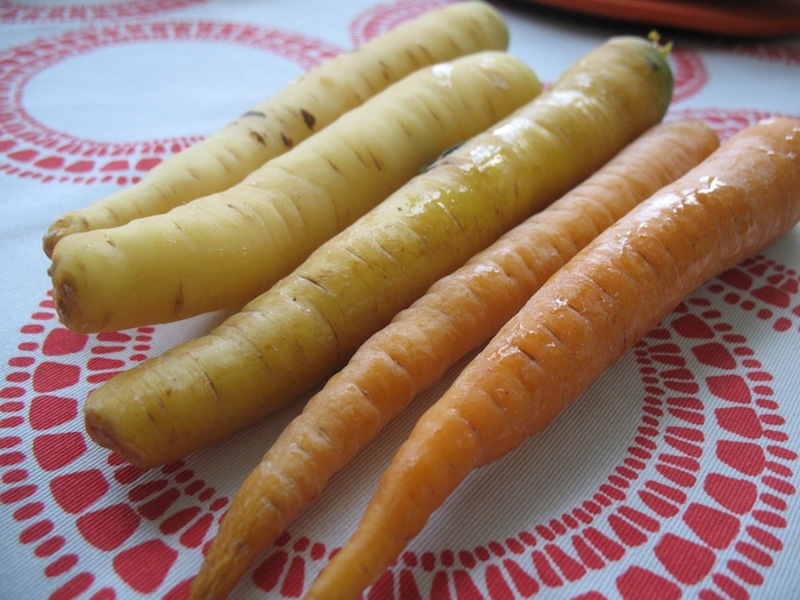 I am using a variety of light-colored carrots that we bought from a market in Montreal. Some of them are yellow, some appear white inside. There is, of course, nothing wrong with using orange carrots in this recipe. They’ll be just as delicious. 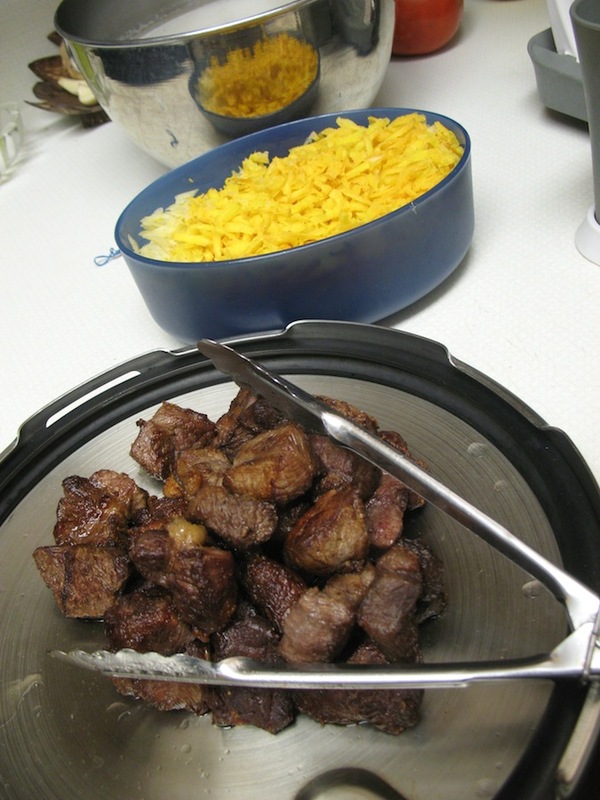 1 lb beef with fat, cut into chunks 1″ or larger. Meat with bones is fine too. The general idea here is to brown meat in a lot of oil, stew that meat (especially if it is a tough cut) with onions, add a layer of carrots and rice and cook until the rice is done. 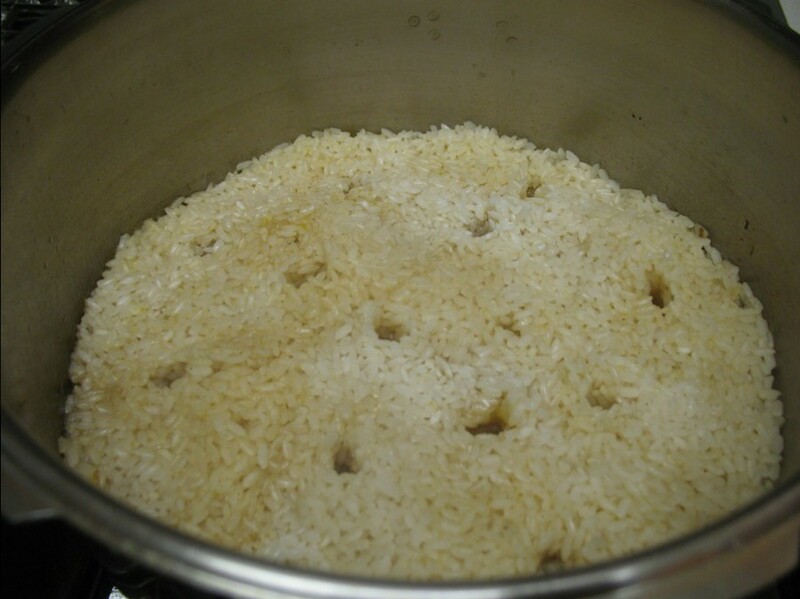 This can be a little tricky, because you don’t want the bottom to burn, and you don’t want your rice undercooked when the water has evaporated. Cooks in Xinjiang (see here for an instructional video in Uyghur) will use a vessel that resembles a heavy wok with higher sides. The bottom is tapered in a way that will help keep the bottom hydrated (i.e. not burnt) while the rice cooks on top. I’ve found that a pressure cooker can also be used to make a decent polo. Nearing the end of the cooking process you can put the lid on and add pressure. That will help ensure that the rice will cook through. Shred carrots. I use a grater. Set aside. Cut up meat and chop onions. Heat oil to nearly smoking. Put in the meat and brown well. Do this in batches as not to crowd the pan and steam the meat. The bottom of your pan might be darkened with lots of fond from the beef. This is good. Take out your meat and set aside. With the meat out, there is a threat of burning in the pan. Put in your chopped onions. Stir and bring up all the fond off the bottom of the pan/pot. 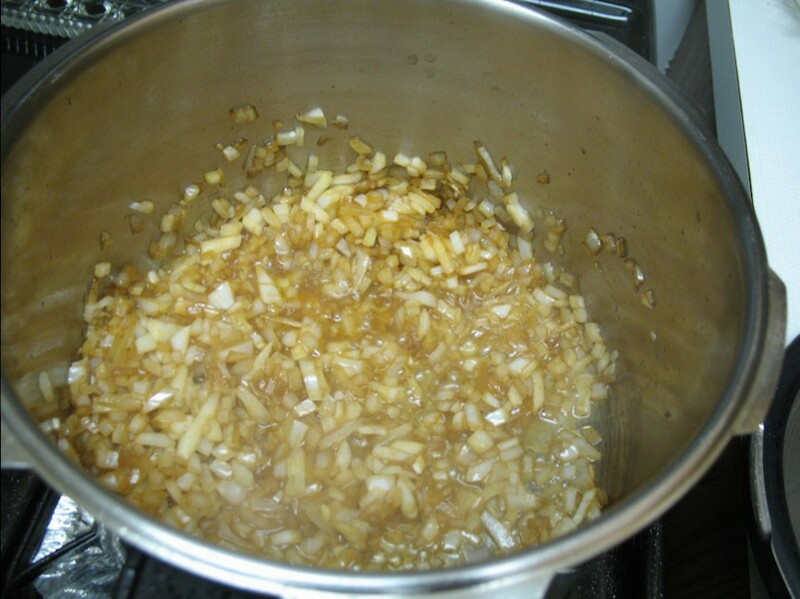 If your meat is a tough cut, you might want to stew the meat and onions for some time before beginning the rice. To do this, add some water to barely cover the meat and onions and cover the pot. Boil for as long as it takes, up to an hour or more. This time I boiled my beef for about 45 minutes and it was getting tender. Also at this stage, add salt to the meat and onions. The mix should be a bit salty, as carrots, water, and rice will bring that saltiness down. 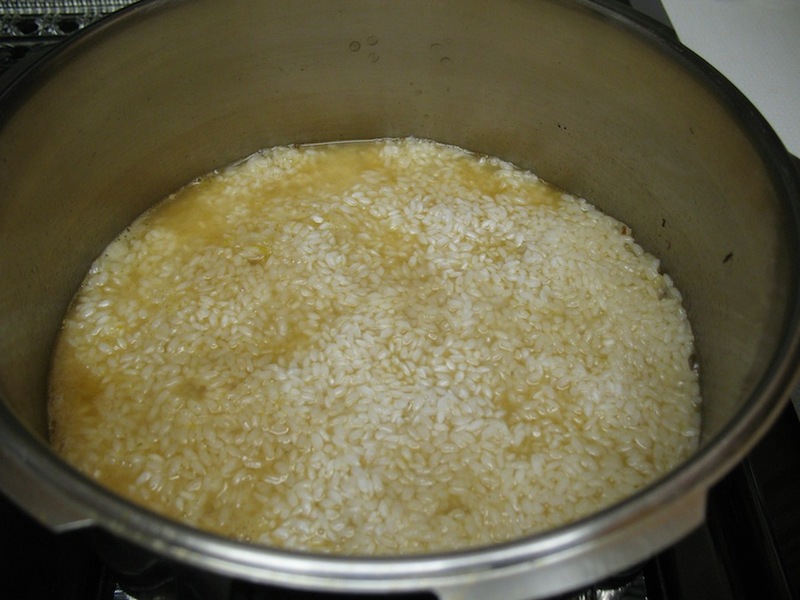 Boil some water in a kettle to prepare to pour over the rice in a few steps. Sprinkle ground cumin and ground pepper into the beef and onion mixture. I used a scant teaspoon of cumin. Layer the shredded carrots on top. Layer the pre-soaked short-grained rice on top of the carrots. Pour boiling water into the pot without disturbing the layers. Since my pot has very straight sides, I poured the water over a spoon to make the water go to down the sides of the pot. Put enough water in to cover the rice. Boil uncovered until the water goes below the rice (you can make holes in the mixture with a chopstick to see this progress). As mentioned above, this is a rich and heavy dish. It is balanced well with cool crunchy vegetables and/or yogurt. Perfect for a cool fall night! This entry was posted in - Featured Food Discoveries, - Recipes, - Unique food traditions, Central Asia/Uyghur food and tagged ข้าวหมกเนื้อ, ชาวอุยกูร์, палау, палов, плов, eid, 黄萝卜, kurban bayram, уйгурский кухня, pilaf, pilav, plov, polo, rice, Uyghur, Uygur, پولو, Xinjiang, yellow carrots, 古尔邦节, 手抓饭, ئۇيغۇر. Bookmark the permalink.